Toronto remains home to Canada's largest concentration of manufacturing - and by creating North America's first mixed-use residential and manufacturing building, the City of Toronto is finding new ways to keep manufacturing in its downtown core. An old single-storey industrial building at the northwest corner of Queen Street West and Dufferin Street in Toronto is becoming a model for urban manufacturing. The property is set to be the first mixed-use light manufacturing and residential development in North America. 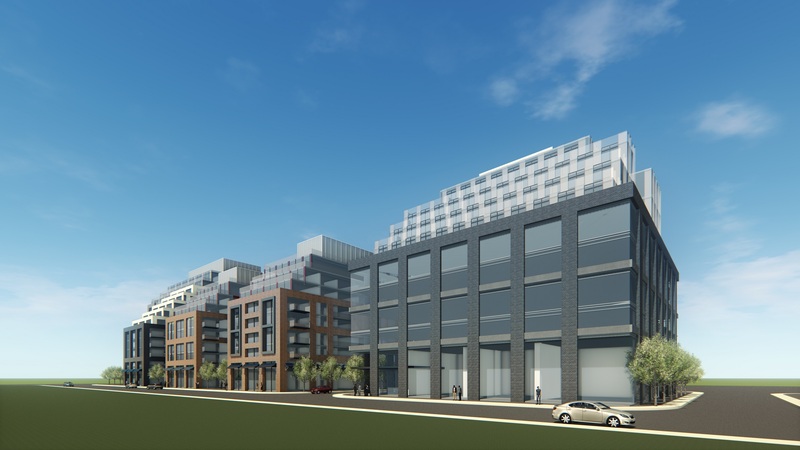 The site, stretching from 390-440 Dufferin, is transforming into a distinctive three-building development. Two buildings will have rental apartments and retail uses. The third will have rental residential units above 60,000 sq. ft. of light-manufacturing space. Of that, 14,500 sq. ft. will be dedicated to a light-manufacturing incubator. It will focus on supporting entrepreneurs looking to bring products to market. Retaining the 60,000 sq. ft. of manufacturing space, and establishing the incubator, was part of the City of Toronto’s agreement for the development. The first goal was to replace the manufacturing square footage being torn down and provide a space to help manufacturing start-ups commercialize and overcome the barriers to getting to scale. The incubator will be an affordable and supportive space for entrepreneurs looking to build businesses in Toronto. Tenants will have access to advisors and mentors, as well as shared production and shipping facilities. The City has issued a request-for-proposals for not-for-profit or post-secondary institutions that would be interested in establishing and operating the incubator. To back the incubator’s creation and success, the City will offer a range of benefits, including below-market lease rates, operating funds and partnership development support to engage other potential supporters. The public proposal call will run until October 2018, and the City will select an operator by the end of December 2018. While the exact nature of the manufacturing incubator is to be determined, the City foresees an array of potential uses. For instance, the incubator could be home to manufacturing that is centred around the merging of technology and hardware, ranging from clean tech to medical tech to consumer tech. Or it could become home to more micro-manufacturing, focused on the commercialization of smaller-batch production in areas such as food processing or fashion. Space could also house artisanal ventures, like woodworking, or jewellery or furniture manufacturing. The manufacturing sector remains of strategic importance to Toronto. While the city (and Canada) has experienced a downward trend in manufacturing jobs, Toronto’s manufacturing sector still employs 132,000 people. Moreover, the number of manufacturing companies in Toronto is increasing, due in part to the rise in micro-manufacturing and hardware development. Overall, Toronto’s manufacturing sector is the largest in Canada and represents nearly 13 per cent of Toronto’s economic output. Toronto has the educated, inventive and globally-connected talent to be at the forefront of modern manufacturing. The City’s approach to integrating manufacturing into residential developments will be yet another sign that Made in Toronto stands for innovation.